The ScanGaugeII is an extremely compact automotive computer designed to read and display information about your vehicle in real time. Simply connect the ScanGaugeII to your vehicle through it's OBDII port using the included cable, turn the ignition key and the ScanGaugeII automatically connects to your cars internal computer - it's that simple. Works with all 1996 and newer vehicles. Free Priority Mail shipping to most US locations. Usually ships by next business day. Please allow 2-3 additional business days for delivery. New Add-A-Gauge™ and XGauge Features! Automatically tracks four sets of trip data - Each with 11 individually stored parameters. Display 4 gauges at a time from the 12 built-in digital gauges. the information is presented in Real-time! 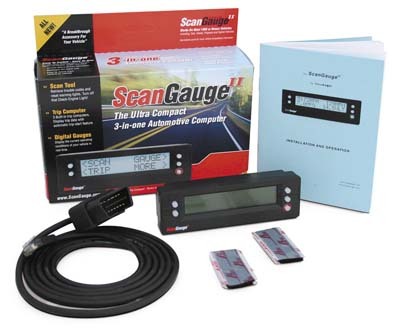 The ScanGaugeII allows you to troubleshoot your own car, read error codes, and the conditions present when the error occurred. You can also turn off the “Check Engine” light and avoid those costly trips to the mechanic. 7 Standard screen colors and a custom setting with 63 possible colors. Cable detachable at the ScanGauge II. Can be connected on the back or side.